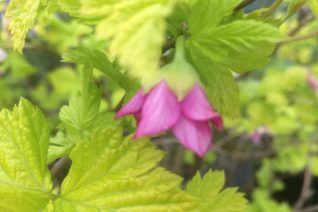 Shade is an important category in PNW gardens. Towering trees block out the sun and let woodland plants thrive. High overhead shade is a category where you can fudge a little bit. Often its shady enough for those that shun bright sunlight but is bright enough for plants that require sun. Shade is characterized by 6 hours or more of indirect sunlight. Plants that require shade will burn almost instantaneously if exposed to brilliant, hot sun. Plan ahead when you plant trees and site structures. Trees will inevitably grow and cast more and more shade. One trick if you are free of a tree canopy is to plant shade lovers on the north side of walls, houses, trees. This is often just enough sun protection for these plants to thrive until the overhead canopy fills in. When you’ve given up all hope, When you think nothing will grow there enter this rugged, pioneering native to the rescue. Infamous for its weedy introduction have you ever had a close look at our own NATIVE populations? They yield truly showy flowers that are large cones with relatively large velvet purple flowers protruding. They make a great cut flower too. Found from the arctic to the tropics on North America. This form is genetically native stock. Full sun to quite a bit of shade in virtually any soil. Not as rambunctious as you would think but not a shrinking plant either. Very wild appearance and we like it. One of the first wildflowers that I recognized as a child, and when I was introduced much later to the weedy type I was sorely disappointed. Responds to regular water by blooming continuously. Reacts to withering drought by becoming limp and sometimes crisps. It always comes back. Mostly evergreen in our climate. To 6″ tall in bloom otherwise prostrate. Bees adore this plant. 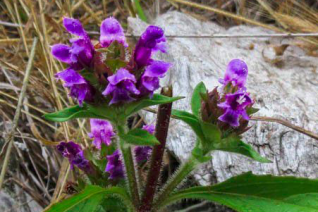 Aka Lanceleaf Selfheal. A good native weed. Oregon Native Plant. 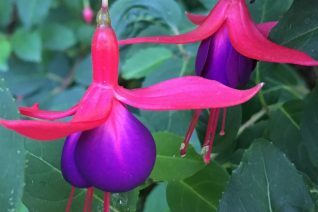 We love ultra hardy Fuchsias, they are so carefree and they bloom and bloom. We found this Fuchsia in a garden near our shop. It was identified by our friend Annie Hayes at Annie’s annuals. Large growing subshrub to 5′ x 6′ in time. Red sepals surround a deep purple corolla with each petal marked with a strip of hot pink. Lovely. Flowers are large for a hardy Fuchsia and are profuse from June to frost. Fuchsia mite resistant. Very easy to grow in light shade to full sun. Rich, well drained soil with regular summer water is ideal. Very established plants can make due with less. Freezes to the ground in the low 20’s- but not every year. Wait until new growth emerges then remove the frozen material. Loved by hummingbirds as well as gardeners. Lustrous deep green foliage outlines the pendant flowers. You’ll never lose this long lived plant to winter. Good to try where rabbits are a problem. Famous for its hardiness to cold, this shrub eventually becomes very big with very large double, powerfully fragrant flowers. 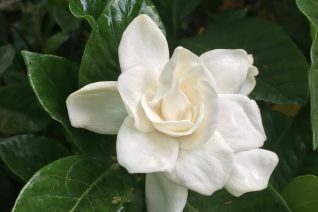 This fabulous Gardenia gains cold hardiness with age. Rich, moisture retentive soil that drains- see- LOTS OF COMPOST and regular summer water. That will not only speed growth and establishment it will encourage a constant supply of blooms from on average early July to September. To 4′ x 6′ in 7 years. Best in a protected location- especially from east winds. Full sun to full shade. Excellent with some overhead protection- tree branches , eaves, or a pergola. This slight protection provides the plant with less dramatic swings in temperatures which helps it harden off to cold. REGULAR irrigation is crucial for the first few years. Never let a Gardenia dry out entirely- no like. All the leaves from the interior out will turn yellow and drop. Not pretty. But a well grown shrub is gorgeous with large, deep green glossy foliage ensconcing the 3″ wide flowers. The fragrance will waft in warm summer conditions. Lovely. Excellent in containers – pay attention to irrigation and move the containerized Gardenia to an unheated garage or porch. Lucious and very tropical looking. Resprouts from the base if frozen. 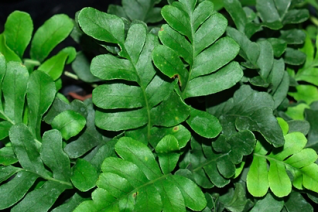 Coast Polypody or creeping leather fern is an evergreen colony forming plant that is native from British Columbia south along the coast to even the Guadelupe Island off of Baja. It makes its home on logs, rocks, the ground almost anywhere it finds adequate moisture and shade. During the summer it will take a surprising amount of dryness but we recommend light consistent irrigation for the best appearance and to spur multiplication. Fronds to 10″ long with rounded lobes. Excellent garden plant, grows very well in rich to average soil as well. Good year round appearance. A native fern that should be grown all the time. 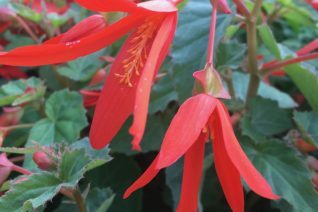 Great in winter containers- excellent winter appearance with little maintenance. Protect from hot sun. Highly deer resistant. Oregon native plant. 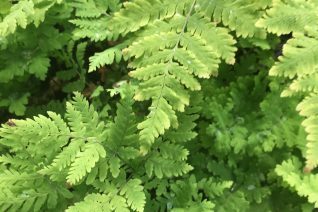 Western Maiden Hair Fern is native from the Aleutian Islands in Alaska south mainly through shady wet spots in the west south as far as Chiahuahua, Mexico. Its even locally native from Maryland to New Foundland. Its a long lived and vigorous fully deciduous perennial for perpetually wet sites. To 2′ tall and spreading almost indefinitely where conditions suite it. Heavy clay soil that retains consistent moisture in part shade to shade. Often found lining water falls in Oregon or in deep cool moist gullies. The multi fingered leaves are a soft green and are held erect on jet black stems. Very good sited at the bottom of a downspout. Very easy to grow given consistent moisture. Oregon native plant. A fantastic, tough but elegant and demure fern known as the Northern Oak Fern and its native habitat is nearly circumpolar in the Northern Hemisphere including right here in the state of Oregon. Finely incised, delicate looking lime green foliage has an affinity to paper lace doilies. Completely deciduous this fern creeps by stolons to form large patches in part shade to shade. Best in soils that are somewhat light but endures even heavy clay soil. Light consistent summer water is ideal but established plants withstand considerable drought. 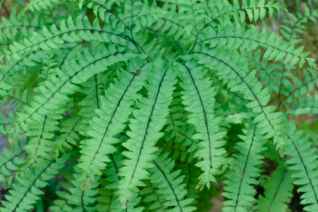 This fern with an appearance so delicate is actually a survivor of a plant and is very easy and satisfying to grow. Dies back in the darkness of autumn and emerges mid-spring. Excellent deer resistance. Competes well with tree roots. Surprisingly rare in commerce. Oregon native plant. This species is one of the progenitors of modern Tuberous- non-stop Begonias. In of itself a tough perennial that if you are patient will make an appearance year after year. To 1′ tall (slightly taller) angel wing shaped bold green leaves are a wonderful backdrop to the masses of striking orange/red flowers that appear from July to October. Each of five petals recurves as it opens to an elegant effect. Very easy to grow as a container plant. To over winter simply let the plant die back in late autumn and move the container to a sheltered site. Mine goes against the wall of a covered outside patio and in 15 years I’ve never lost a plant. Grows surprisingly well in the ground in well drained rich soil in part shade. 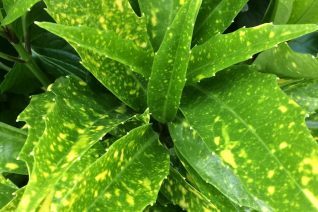 Be aware that returning plants emerge late – Often not showing their presence above ground until mid-June. Best with an annual application of organic fertilizer. Regular water, but never permanently boggy. Excellent performance in our climate. The outrageous amount of flowers produced make this plant a regal winner. Inside-Out-Flower is a commonly seen terrestrial component in dry to moderately moist woodlands in our region. 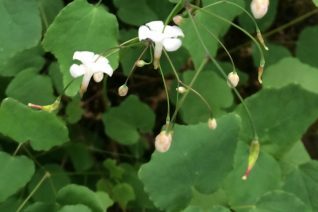 The duck foot shaped leaves are conspicuous and pretty and in late spring to mid-summer a continuous supply of dainty downward pointing white flowers. Spreads in gardens very well in enriched soil with regular summer water where it will quickly assume the role of an intertwining ground cover. Winter deciduous- un-like its close and much more drought adapted relative Vancouveria chrysantha (Yellow inside-out-flower, Siskiyou Vancouveria). This perennial is perfect for life among shrubs or mixing with other woodland perennials in part shade to shade. Adapts well to garden culture and thrives on regular summer irrigation. Locally native in the city of Portland. 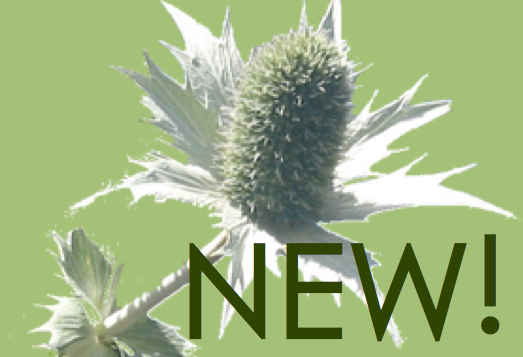 To 10″ tall and spreading. Some deer resistance. Oregon native plant. This golden leaved form of our native Salmon Berry is an exciting variation for wild areas. The brilliantly colored foliage sparkles with deep pink flowers in spring. In summer it produces salmon colored sweet, edible berries. To 7′ tall and spreading as wide as it would like. Full sun (with irrigation) to quite a bit of high overhead shade. Give this colonizing plant room to spread. It appreciates moist soil but is very tough when established. Deciduous- though it is a short period and the brilliant new leaves begin emerging in late winter. Stream banks, the back area of woodlands, wild areas. Moderate deer resistance. Increases by suckering stolons. Easy native to brighten wild woods. Oregon native plant.